How do I perform a clear cut spell for someone else, to get rid of past associations with people who have been their downfall in love and in life, and cut out situations and habits that have lead them into trouble? I posted awhile back about my experience with working the reconciliation spell, and finding through the process and the meditative practice, the clarity that I needed to realize that I really did not want to attempt a forced reconciliation with my ex. While in the past months, I have not attempted any further reconcilation tactics, spiritual or otherwise, I have continued to nurse a broken heart and this nagging delusion that my ex was the perfect one for me, my soul mate, blah blah blah, but at the same time, realizing in my rational mind, that this is a delusion and he is not the person I need to be with. I came to the site again and was reading the forums and was led to the page that Catherine wrote about the Cut and Clear spell. It touched me so deeply and I am so impressed with Cat's talent as a healer through her words...and it really hit home for me...this is man that left me while I am dealing with a cancer diagnosis...talk about weakness! No one that loves me would leave me while I am in this crisis situation! The lingering delusion that he is mr. wonderful because he stayed with me during the first five surgeries, can not overpower the reality that, ultimately, he did not love me enough to stay with me. He went from talking about marriage to defining our relationship as "friends with benefits". So, I have ordered the Cut and Clear supplies and am looking forward to putting an end to this tyranny over my heart and open myself up to be loved and to love someone that has the character and strength to stay with me through thick and thin. One of the gifts of dealing with catastrophic illness is that it tends to really clarify the reality that the time that we have on this earth is short and precious and not to be wasted on dead end relationships and people that are unable to love. So, I just want to express my appreciation for this site, for Catherine's writings and for the healing and clarity that I have found here. It is far beyond what I had expected. I wish you much success with your cut and clear work. Knowing that you are worthy of finding a truly suitable, kind-hearted, and loving mate is an important foundation to lay down for a better love life and happy love conjuring! Well there were no specific saints or beings invoked in the Cut and Clear trick but it has worked very well, I wanted to thank Miss Cat for her wonderful work, online archives and products. Congratulations on a successful work! Just so you know, there are a lot of workers who only work with God or Jesus and do not work with Saints at all. The number of Catholic rootworkers is actually pretty small compared to Protestant workers, and of course nowadays there are Atheist and Agnostic workers as well who can get a long just fine, especially if they are comfortable with the Bible. ok thanks for the information, I am still pretty new at hoodoo, but hoping to learn more! Then I tried a two color reversible (white black) candle to send back the things he had done to me --- the wax formed into a snake and then I began having extremely bad luck ALL day the next day after i finished it. I had a divination some weeks ago with CAT and she might remember the phone completely cut off on us when she made a mention of what was going on with him--- and when we got back on she told me that she felt it was him (his energy) and that he would be hard to get rid of. So it is obvious that he is extremely stubborn and that whatever I am doing does not seem to be working. I purchased a doll baby from LM but have not started the work on it because I am unsure if I have a bad hand at this. My desire is simple to get rid of him, stop him from harassing me and trying to take my child and the icing on the cake would be to send back all the things he has done back to him... Although I am more than willing to do the work myself I am not sure I am doing it right, perhaps my mind and energy is too scattered but I would greatly appreciate some advice on what I am doing wrong and what I should do going forward. Should I try a different strategy? or Should I consider working with a practitioner or having the work done at a LM altar? The process of doing Cut and Clear work will help you sort and clarify your emotions and thoughts, and remove lingering emotional attachments that may be hindering you from more effective action. If you perform a Cut & Clear spell to get over someone you care for who just doesn't respond the way you want or that you constantly have to hoodoo, it helps you cut your emotional ties with them... but does it also end the friendship itself? No it will not end the friendship. It will just cut the emotional ties, and put them as how they should be. So yes a clear and cut is appropriate here. Does the cut and clear cut the emotional ties both way? Or only on the one doing it? jackstar.. you nailed it. that's what I want.. I don't want to cut his feelings for me.. but I'm tired of it being lopsided. I do and do and do for him and he takes me for granted a lot of the time. I want soemthing that will help me get to his level of interest or lower.. but not diminish his.. as we all know, the person who cares the least controls any relationship. I just want to find something to make me care less..
A Cut and Clear Spell Kit is not about the other person. It is about helping you come to terms with a dead end relationship, where you give more than the other person does. Actually, in my experience with Cut & Clear, the other person comes forward after it is done. Do not do the Cut & Clear with that objective though. The Cut & Clear also has the added bonus of drawing in a more appropriate partner to replace the current bad one. Mary, THANK YOU.. you are awesome.. that's all I wanted to know.. I'm just worried about my emotions and disengaging MYSELF.. I know I could do a bend over, etc. but really I just want to get him off my mind, etc. and move on.. to hopefully something much better.. becusae I find as long as he has that control I have no ability to get to where I need to be. Thanks.. I'll place an order now. i agree too i thought about doing a cut and clear but am worried the other person will stop having feelings for me (even though they are being controlled by someone elses spells to not have feelings for me any longer) its a difficult situation but i feel i care way more than she does me. This was a very interesting post about the clear and cut and given more information about it. At one point I thought that the clear and cut end the friendship, but it doesn't. I'm glad that it does not end the friendship, yet it open lines of communication and start over again. [quote][/quote]Cut & Clear is not about the other person. It is about helping you come to terms with a dead end relationship, where you give more than the other person does. Actually, in my experience with Cut & Clear, the other person comes forward after it is done. Do not do the Cut & Clear with that objective though. What did you meant by this statement? Does that mean that the current person or friend will come back. The reason why I had said this even though I can't talk about my work, but all I can say is that I'm starting over my relationship with my friend with the clear and cut to start over again. what is the easiest way to Cut and Clear yourself from someone ... a 7 day Cut and Clear vigil candle, a 4" candle anointed in Cut and Clear oil, the Cut and Clear spell kit - or any other idea?? I just need to let go of a certain guy because he always stands in the way of my finding someone else. Please let me know how you have performed Cut and Clear and if it was successful. 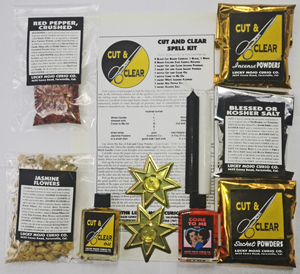 Having you tried looking into the Cut & Clear spell kit? I think it's best to perform the spell as a whole, and not just burn individiual candles. There are very detailed instructions and steps, which I imagine play a siginifcant role in the spell's success. And with a spell for this purpose, you don't want to take any shortcuts. Could someone use a cut and clear spll to slowly detach their feelings from someone that isn't good for them? Not necessarily a break up, just something that lifts the smoke vail sort of to speak, so she could make the decision her self to break up once the feelings are no longer attached? Is if it's possible to do a cut and clear on someone else so that they'll simply move on from a situation or person? If anyone can shed some light on this theory, or point me to a book/resource that could explain it further I'd really appreciate it. bleuskyye -- This is not recommended. You may call it a Cut and Clear, but you are actually doing a Break Up spell on them. Lucylookingskyward -- Same reply: Causing two people to stop being involved is a Separation spell (peaceful) or a Break Up Spell (angry) but it is NOT a Cut and Clear Spell. mabel -- it is YOUR spell to perform for YOU, on YOU. It s not a spell to make another person fall out of love with you. For that, you would be doing something highly different. I would do Clarity for "slowly detaching" because Cut and Clear is more abrupt. Devi is on the right track with this one using Clarity products, I would also add King Solomon Wisdom to help her make the right choice once those choices are made clear and Cast Off Evil which is for helping one to remove bad friends and associates. Cut and Clear is for a complete removal. I checked the forum and couldn't find the exact answer I was searching for. Once you do a cut & clear of someone, what should you feel regarding the person? Apathy, disgust, fondness? Also, once you do it - should you avoid talking/seeing them for a while? As in, do it and the next day speaking to them could sort of get in your own way for it being productive? Thanks. Anyone who has tried it with success, please just let me know what you felt toward the person after you completed it. I'm really glad someone asked this question, and can't wait to hear what others have to say about this! In my experience, especially when you're trying to get rid of romantic feelings for someone, it takes a little time for you to feel the full effects. When last I did that spell my clarity came at me in waves. At first I didn't think it had worked at all, then one day it was like someone flipped a switch in my heart and while I still felt attachment to him (this was an unhealthy relationship that lasted years) I didn't feel pain or need anymore. Once the emotional turmoil cleared, I was able to see things logically, and my whole perspective changed. Now I see this person all the time and feel no trace of the romantic feelings I once held for him. The thing to remember with this kind of work is that it took you time to cultivate these feelings and so it'll take time for you to grow out of them. The Cut and Clear is not going to change you overnight, but it can give you the confidence and the clarity to see the truth of the matter and to move on successfully. Think of it like those nicotine patches to help you quit smoking. It's a process, but with faith and trust in yourself and your work you can get through it. my experience is the same as suzy I did it over a selfish ex who I loved and it just changed things. Though I did avoid him during the process I feel if you are real about getting over it then you should show it both in the magical and physical world.. after the bath make a bold move get rid of the things they gave you, pics of you..etc. and regarding the cut and clear or black walnut bath. What if one has a new partner yet wanting to do something to rid the feelings of an older ex?? wont it affect your new relationship? blackforrest wrote: and regarding the cut and clear or black walnut bath. It really depends for me. I had to do a Cut & Clear with a black walnut bath for my father and that has been the hardest one. Since my father is truly a part of me, I will always love him, but now I no longer need to have him in my life and his feelings have no affect on me now. I also no longer have a strong psychic connection to him. Funny, but I wrote an article about the end of my last marriage and I had forgotten about it. Recently, someone contacted me about how the essay resonated with him about the end of his marriage and I could not remember the essay! I had to look it up. I remember at the time I wrote it (around my ex's 50th birthday), I felt so much sadness and longing, but now there was nothing. It's as if it happened to another person and that is the same for my other ex. I just don't feel anything. They are like strangers to me. So it depends on the person. Mary, thanks - as always - for the advice.. that makes perfect sense. I have a problem, and I'm not sure of which product will help me. I dated a guy recently that I seemed to hit it off with. The problem is this person lives with someone he is having problems with (both parties cofirmed they have problems with each other). The guy came off as being really confused. He would say he was going to try and work out his situation, and then come to me a few days later. This has been consistant through the situation. I suspected that he was under some type of influence, and had a reading in which it was confirmed that the other woman involved in this was doing something to bind this man to her even though neither of them is happy with the other. I was advised that the best thing for both women involved would be to find someone else, and I specifically should take from the relationship all the positive aspects, and focus on finding those qualities in another person. I can't stop thinking about this man. My logical mind tells me that I should let it go, and focus on bringing someone into my life, that doesn't have issues, but I fear that if I attempt to do, lets say a Cut and Clear, it would not work because I really don't want it to. In a way it may seem crazy , I kind of feel justified in trying to break this couple up because in my mind she is not playing "fair" because she is using black magic in the relationship. I did a break up candle on this couple, and one of the parties left only to return after the candle went out. I have people in my family that do root work, who have advised me that if you attempt to hold people to you that would otherwise walk away from you if you were not working on them, then you end up with a confused unhappy person, and you will have to constantly work on this person to hold them, and if you bind a person to you, you are binding them to you just as they are ( if the guy is a cheater then you will just be binding yourself to a cheater, etc.). So this other woman will struggle and be unhappy until she gets wise. I don't doubt what they were saying, and I know this was their way of trying to get me to move on from the situation that will be an uphill battle. I don't know what to do part of me, most of me wants to continue to try to break these people up no matter what I have to do, but there is some sane part of me that says it would be a lot easier to do work to bring a man that is free and clear into my life. I don't understand why this person is affecting me this way in such a short period of time. This has never happen to me before. I can usually walk away from things like this without batting an eye, and in the past it has been my practice not to try break people up,or bring them to me under any circumstance, even when it was concerning my own marriage, and my husband was having an affair, I'm ususally of the mind set that everything happens for a reason, and if this person is meant to be with me or come back to me then they will, the most I have asked for is clarity in a situation, so I really don't know what's going on here. I wish there was a way to erase this person from my mind, this is keeping me awake at night. I'm thinking about this man constantly, and I am starting to fear that this other woman and I are crossing each other up (ex: I do something to make this person think of me, she reverses it, causing me to think of him). I wake up thinking of different things I can do to try and separate them. I don't understand why this is happening. Should I just do the Cut and Clear regardless of how I feel, and hope for the best? Take a cleansing bath (uncrossing, jinx removal or alike) and possibly clean out your apartment with some Chinese Wash.
Get some King Solomon Widom products (or Clarity products) and use them on a Wednesday or Friday before you go go to sleep. (Do not do anything else, like reading or alike before you go to sleep). On the morning after ask yourself again if this is a man you would like to be involved with and if you still feel like breaking them up etc. I also highly recommend getting all your feelings out by just wailing and screaming. Get the house to yourself, curl up in a blanket, and just cry and scream and moan and wail and let it all out. It's a good way to acknowledge the pain you're in, the conflict you feel, getting it out of you so you can hear it and feel it and finally let it go. I'm in the middle of doing a 13 day bath (today, will be day six). The bath was recommended for another purpose, and I feel it is working, but not on this. Maybe by the end of the 13 days, I will feel differently about this situation. I was thinking of trying to hotfoot , or using the break up products on myself. I've been doing a lot of wailing, and anything I can think of to distract myself. Thank you two, for helping and I will try your sugesstions if anyone else knows of something I should try please let me know. Thank you all again. opal73 wrote: I'm in the middle of doing a 13 day bath (today, will be day six). The bath was recommended for another purpose, and I feel it is working, but not on this. Maybe by the end of the 13 days, I will feel differently about this situation. I was thinking of trying to hotfoot , or using the break up products on myself. I've been doing a lot of wailing, and anything I can think of to distract myself. Thank you two, for helping and I will try your sugesstions if anyone else knows of something I should try please let me know. Thank you all again. And like Johannes says, I think the best way out of this mess will be to first cleanse yourself, (with regards to this CURRENT situation; I'm not sure that a bath that you take for one problem will likewise cleanse other situations) then use some King Solomon Wisdom and/or Clarity products to help you see through the fog of your emotions, then decide on the best route to take from there, whether it's attracting him to you, breaking them up, or cutting him loose. I kind of feel justified in trying to break this couple up because in my mind she is not playing "fair" because she is using black magic in the relationship. I did a break up candle on this couple..
By using Hoodoo to break them up or get him back, wouldn't you be doing the same thing..? Thanks again, I guess I am doing the same thing by using Hoodoo to get him back, but I also feel that I possibly wouldn't have to do it all if she wasn't already working on him. I also think that I am spurred on by the fact that he keeps coming back, that he is some how on some level fighting what she is doing to him. I will start another cleanse after this one. If I still have these feelings afterwards, then what? I keep telling myself "This too shall pass" , "This too shall pass". opal73 wrote: Thanks again, I guess I am doing the same thing by using Hoodoo to get him back, but I also feel that I possibly wouldn't have to do it all if she wasn't already working on him. I also think that I am spurred on by the fact that he keeps coming back, that he is some how on some level fighting what she is doing to him. You could then sneakily cleanse him of the spells she's already weaved on him, (I presume he won't take kindly to any rituals or spells?) which, if your suspicions are correct, should break them up. If you're close to him in the sexual sense, you could invite him to take a soothing bath together with you, if you get what I mean You could also add oils such as Cast Off Evil or Banishing to a bath (a pre-prepared 13 herb or cleansing bath would be ideal, of course), or even secretly dab some on him or his items, along with some suitable love oils to draw him to you. The other route to take, of course, would be to Cut & Clear. The purpose of the cleansing baths are not to rid you of your feelings for him, but to cleanse you of your confusion and negativity surrounding the situation. The Cut & Clear will, as its name implies, snip and clear him out of your life, along with any remaining affection or unwanted feelings you have for him. I hope this doesn't confuse you too much- and like I said in my previous post, use some Clarity or Wisdom products to clear your thoughts before you make any decision. No it's not confusing. I have started a cleanse on him using a doll baby, because I know he would not agree to do it in person. I have heard of the mirror box spell, I will into it further. I have also started a vinegar jar, and a freezing spell on her thinking that if I worked on her and souring her feelings towards him she would stop binding him. I've got a lot going on here, I know. Thanks again. opal73 wrote: No it's not confusing. I have started a cleanse on him using a doll baby, because I know he would agree to do it in person. I have heard of the mirror box spell, I will into it further. Thanks again. Is he aware that he is being worked on by the other woman? Is he fighting it? Anyways, having a 13 herb bath (dressed with love oils) together with him will work wonders for your relationship, and will also serve to cleanse him of some, if not most, of her grip on him..
hiighpriestess wrote: Anyways, having a 13 herb bath (dressed with love oils) together with him will work wonders for your relationship, and will also serve to cleanse him of some, if not most, of her grip on him..
i would caution against mixing cleaning and love work. Do one or the other,but not both at once. HailDiscordia wrote: i would caution against mixing cleaning and love work. Do one or the other,but not both at once. The main purpose of the bath should be for cleansing, of course, but I thought that adding some love oils to it would help sweeten them up to each other, and the act of bathing together should bring them closer.. I don't think he is aware that he is being worked on, or that he would believe me if I told him that's what I thought was going on. I got my information from a worker that I trust. What makes me think he is fighting it is that he tries to get away, when ever he says he wants to go, she leaves the house with the intention of moving (it's his house), and then she returns , and we are back to square one again. opal73 wrote: I don't think he is aware that he is being worked on, or that he would believe me if I told him that's what I thought was going on. I got my information from a worker that I trust. What makes me think he is fighting it is that he tries to get away, when ever he says he wants to go, she leaves the house with the intention of moving (it's his house), and then she returns , and we are back to square one again. Oh, gosh, I'm so sorry, when I quoted your previous post on working the doll baby, somehow the word "not" disappeared, along with half of your post, so I didn't read it in its entirety..
opal73 wrote: No it's not confusing. I have started a cleanse on him using a doll baby, because I know he would not agree to do it in person. I have heard of the mirror box spell, I will into it further. I have also started a vinegar jar, and a freezing spell on her thinking that if I worked on her and souring her feelings towards him she would stop binding him. I've got a lot going on here, I know. Thanks again. The freezing spell is a great idea, and in addition to the vinegar jar, you should use some of LM's separation/break up products to speed up the process, as I find that the effects of the vinegar jar are not immediate, and requires time and patience to work. Also, you should sour their feelings towards each other, not just hers. Sorry for the misunderstanding, and good luck! I absolutely agree - I would not mix anything else into a cleansing bath. Do one work per ritual - if you're taking a bath for cleansing, then take the bath for cleansing. Don't mix it with anything else. Let it do it's job without muddying up the energies. If you mix things that are at counter purpose to one another you're risking it not working at all on either front, or having some strange effect that you were not able to plan for - you don't want to cleanse his love away do you? Devi Spring wrote: I absolutely agree - I would not mix anything else into a cleansing bath. Do one work per ritual - if you're taking a bath for cleansing, then take the bath for cleansing. Don't mix it with anything else. Let it do it's job without muddying up the energies. If you mix things that are at counter purpose to one another you're risking it not working at all on either front, or having some strange effect that you were not able to plan for - you don't want to cleanse his love away do you? Ooops! No, that wouldn't be pleasant at all.. Thank you for correcting me, (before I did it myself, lol!) and I'm so terribly sorry, Opal for all the confusion- if you take a cleansing bath, with or without him, stick to one spell/working at a time! Thank you, Devi and HailDiscordia! I think I may try to stick it out a bit longer. I am not ready to give up yet. I have been warned that my best course of action is to "cleanse" myself of this person, even though there is something there, because while he and this woman have not been in love for quite sometime she is hell bent on holding on to him, no matter what, and if we end up together we will not have any peace because this woman as it stands now does not want to let him go, and will continue to make trouble,and that it may take years for her to cease with these actions. So I have been warned, I know what I am facing. In addtion to all the great advice I have received here, I will speak with the worker to ask her opinion also as to what she thinks my best course of action will be in order to work against this. I will go on until I am ready to let go I guess. Poor guy, he might end up in the psych ward by the time we both get through working on him. LOL. Poor guy, he might end up in the psych ward by the time we both get through working on him. LOL. Do be careful, though, protect him from her before you start working on him yourself, and take it SLOWLY, one spell at a time, or he WILL be "overloaded", and might just do something totally unexpected.. Working multiple spells at a time may seem promising, but it won't work out well, as you'll be required to focus on each and every working with full intent- it's definitely easier to concentrate on 1 at a time, rather than 5.. I wish you all the best, with whichever path you intend to take. Do let us know how things go! Thank you so much. I think that I will focus on cleansing first, and then I will proceed with the other things even if things don't work out between the two of us at least he will be free. It's hard for me because I want to do everthing at once. I know it's hard to fight that urge to do everything at once - you get so excited knowing there's a course of action to be taken. It can be hard for me to convince people that I work for that they really need to do one step at a time and see how that one starts working to manifest before moving on to the next steps. But for one thing, there really IS a limited amount of energy that anyone has for work of this nature - it takes time and energy and effort. If you really put yourself into a particular work, it can be exhausting. To run right into another work without recouping your own energies will just weaken your work overall. You want to make sure you can approach each trick fresh and envigorated. So I think it's a good decision to just focus on some cleansing for now. You may find that some of the other effects that you were going to work for will naturally start to happen as the mess gets cleared away. So be patient, be diligent, and pray. Thank you, I will continue the cleansing before anything else. I have been thinking of doing a Cut and Clear spell to fall out of love with my sons father. my life would be so much easier if i did not love him so much. My concern is, does the Cut and Clear spell affect his feelings also, I am afraid that he will stop providing for my son if I do the spell. As much as I would like to I can not cut him completely out of my life, as we do have a son to raise, and I need him financially. he short answer is the Cut and Clear only affects YOUR feelings for your ex. It has nothing to do with him. A financial spell will keep him paying child support, a bonding spell will keep him caring for offspring. In addition to the Cut and Clear, I would suggest that you also do some money drawing work so you are not so dependent on him. This would go a long way in improving your self-esteem and cutting emotional ties with him. I'm not saying that he shouldn't pay the support, but circumstances change (job loss, etc. ), and it is always a good idea to have more than one source of income. Reading about all this Cut & Clear I was just curious to know if you can use Cut & Clear to help with the process of a break up spell. Can you do a cut & clear on the couple you are trying to break up? I was just curious - I didn't see anything referenced. mmcpower wrote: Reading about all this Cut & Clear I was just curious to know if you can use Cut & Clear to help with the process of a break up spell. Can you do a cut & clear on the couple you are trying to break up? I was just curious - I didn't see anything referenced. No, Cut & Clear is for you to get over someone. It would not be good for a couple, because it is a personal spell that you perform for yourself. Thanks, Mary - I was just curious. i would do some Pay me now work so that your son's father will continue to pay for your son. If not, you need to go the legal way if he stops paying. Doing this does not take a lawyer, and you can actually garnish his wages.